If you’re British, you’ve probably heard every joke possible about the “ugly” smiles people from the country are allegedly famous for having. Many of those jokes may be cruel, but there is an unfortunate bit of truth in some of their japes. According to a survey from the British Dental Health Foundation, adults in this country have their fair share of dental problems. Over 4/5 of the population have at least one filling, and 31% percent of adults have some form of tooth decay. A whopping 19% of adults have full or partial dentures, and 6% have no nature teeth left in their mouths. The survey does sound bleak, but that doesn’t mean that you have to suffer the same fate many other people have. You can have a beautiful smile, and you don’t have to go through any complicated or painful dental procedures to do it. Porcelain veneers can help you have the beautiful smile you’ve been wanting. 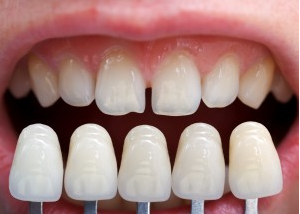 Veneers have been in the news lately because more and more people are starting to use them. It’s possible that you have a few co-workers and friends that have done a little medical tourism and have gotten veneers in Turkey to improve their smile. Porcelain laminate veneers are made up of a variety of thin ceramic layers that actually replace the original enamel on the tooth. Some people believe the misconception that a significant amount of your tooth needs to be removed to proper apply the veneer, but the reality is that a skilled dentist will end up taking no less than millimeter of your teeth. Dentists do this in order to properly and comfortably apply the veneer to the tooth, and also make it look as natural as possible. After the veneer is applied, your dentist will use a curing light to help harden the veneer. Porcelain veneers have become a very popular cosmetic dental procedure because it can help improve a variety of visual dental problems. Do you have a few chipped or fractured teeth you’ve been dreading going to a dentist for? A few well place veneers can easily take care of the problem. Have your teeth always been a little on the yellow side, despite always taking time to brush and floss? Veneers can give you the white teeth you’ve been trying to get for years. Even people that have gaps in between their teeth can get veneers to get rid of the embarrassing spaces.